How Anthony Moore used Medium to grow a HUGE email list for his blog. From 180 to 16,000 Subscribers in 4 Months: How Anthony Moore Makes a Living Online. 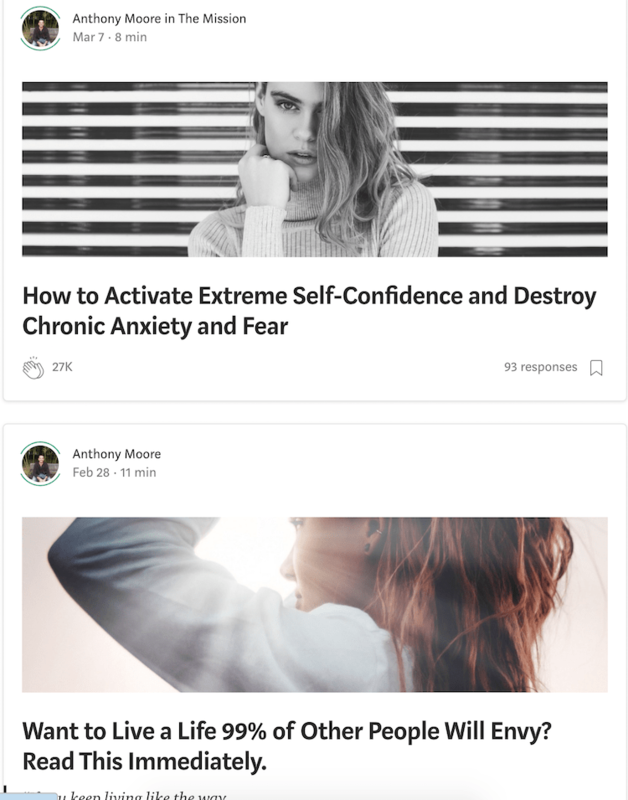 Anthony Moore (Stuff Grads Like, Medium) is one of the TOP writers on Medium these days. After a career in career-counseling (meta! ), Anthony and his wife opted to switch gears, ditching the full-time jobs and traveling the world (and oh yeah, blogging!). After four years and 180 subscribers, Anthony eventually focused his efforts on Medium, and promptly grew to over 16k subs and massive reach (today’s he got over 22k Medium followers as well). Oddly enough, we only talked about this on the podcast for a total of 3 seconds. It stuck with me though, and I think this little tip is SO underutilized for growth (despite the fact that it’s incredibly obvious). Analyze what others are doing. It’s true. This isn’t the most satisfying blog tip ever, but hear me out. We’re constantly seeking tutorials, guides, step-by-step handholding, podcasts (guilty), etc–in an effort to “learn what to do.” An equally effective way of learning is to watch, study, and analyze what others are doing. NOT just what they’re saying. Doing. Remember the Preschool Formula for developing winning strategies? I.e. why you should NOT be quick to unsubscribe from somewhat spammy and salesy newsletter (Genius Blogger’s Toolkit, EBA sales emails, my sales emails, etc)–but rather keep them separate and study them? Yeah. That’s pretty much this. How many words were their posts? What did their titles look like? Identify WHO is doing what you want to do. Keep constant tabs on what they’re doing, not just what they’re saying. Heck, that goes for my podcast as well. Lately, Anthony is teaching folks how to do what he does over at Wealthy Writers, and I kinda wanted to see how he’s funneling people from Medium and his website to that. 1 – He’s published a ton. Enough said here. He’s been writing and publishing a few times a week for a while now. 2 – He uses attention-grabbing images with young, attractive people (mainly ladies). Let’s just be honest. It works. Anthony knows his audience. They’re young and hip. He appeals to them. There’s a good reason that every single Facebook ad course I’ve taken says something along the lines of “use a bright-colored image with either an attractive female or a bearded fit 30-something male). Like, a lot. It’s his bread and butter. These publications do nothing but amplify his reach. Go back and check out my chat with Tom Kuegler for more info on getting into these publications, etc. 4 – He’s extremely explicit with this end-of-post CTA’s. Strong CTA to every. single. post. And because I’m nosy, I even went back to Anthony’s old stuff to try and figure out exactly how he grew his list. Produce lots of content. Grow your craft by watching what others have success with. Never stop list-building. 5 – Every one of his headlines is click-worthy. But clickbait is only clickbait when the content doesn’t deliver as promised. Anthony stuff is engaging and useful. Pair that with click-worthy headlines and you’ve got–well, something good. Specifically, we were discussing what advice Anthony would go back and give his high-school and college-aged career counseling students. There’s really only one way to “discover” what you want to do in life, and that’s to go look for it. (It’s at this point on Do You Even Blog where I’ll spare you my thoughts on education. Maybe I’ll write a full Medium post on this one day soon, but suffice it to say this: I personally believe our culture has significantly FAILED to adapt our education system to our changing economy. Read this Medium article by Seth Godin if you wanna learn more about what I think. Perhaps the WORST way to go about growing your blog is to mindlessly follow everybody else’s “step-by-step guides to massive ultra success in blogging!” Including my own, by the way. There are too many variables in blogging. That’s what it’s crucial to adopt the “LIII Framework” for blog growth. Then, INTERNALIZE them to your unique situation. Take the strategies and adapt them to your audience, your niche, your style. Last, you MUST continue to track, measure, and analyzes results–then adapt and reload. Try a bunch of things. You should start w/ my MASSIVE guide for the first 12 months of an awesome blog, found here. I listened to this epic interview on the way to my day job and started dreaming about working abroad again, and one day turning my side hustle into my full time life. Thank you Pete and Anthony for the awesome tips! Setting up a Medium account today! Great interview! I found it really motivating!